When someone is inside a pit of unfathomable sorrow, condolence is the kindest thing you can offer after what they have been through. The word “condolence” has its origin back from a Latin word “condolere” which suggests “to suffer together”. It is a way to acknowledge someone’s loss and empathize with them in their difficult times. Letters or messages of condolence are written to express your compassion and remind them that whatever it might be, you are still there to extend your supportive hands. Different mishaps should be offered with different condolences. Although, generally comforting texts are sent to someone after a person very close to them is deceased. But in cases where someone had a major accident and is still going through a terrible trauma, you can always come up with some tenderhearted words. However, you might be fumbling for using the correct words or rightly place a phrase because you don’t want it to sound wrong. Hence here is a list of some basic guidelines which would aid you in such situations. It is better to not make the letter rambling and avoid writing a long one. At the time of sorrow, they would neither have the time or intent to read everything you have jotted down. Be precise and compassionate with your content. When someone is overwhelmed with grief, they would hardly care for your money. Therefore, strictly remember not to ask whether they need any money. Whether they are from the same religion as yours or not, follow a particular faith or not, theist or atheist – they still deserve sympathy. You can get back your money later; the deceased won’t be back ever. So, this can wait. The person you are sending the condolences to might have other acquaintances bearing the same name as yours. Hence, always write your full name. 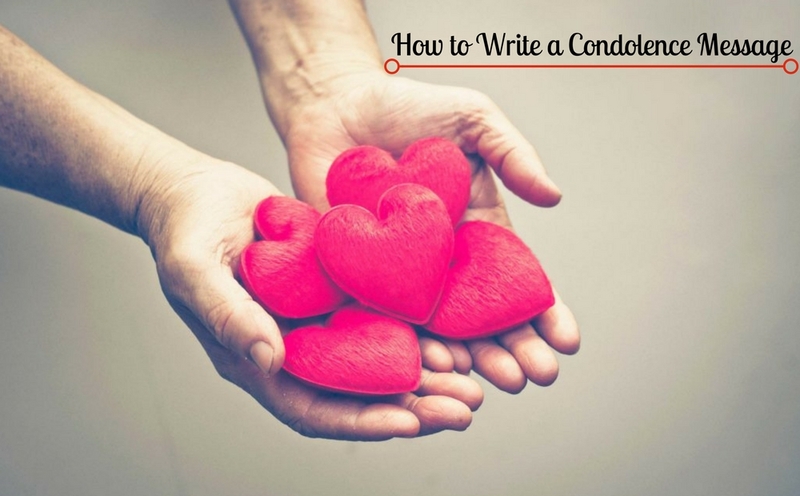 If you’re very familiar with the person you are sending your condolence to, here’s what you can do more to make them feel better. If you are aware which flowers are their favorite, you can send a bunch of those. And even if you are not, a bunch of white lilies or orchids wouldn’t do any harm. Also, you can send them a basket of their favorite flavored tea and attach a note to it. Or you can even donate to the charity on the name of deceased person, to express your support and love. You should always mention the name of the person you are referring the letter to or the name of the family. If you are not quite intimate with the deceased person or is a distant relative, it is suggestive not to make the card unnecessarily sympathetic. One or two lines would be adequate. You can add these lines either on a greeting card or any blank stationery. I just got to know about your aunt’s demise. And am deeply grieved by your loss. Feel free to talk whenever you want to, I’m always here. My heart grieves at the sudden loss of your father. His cheerful nature and graciousness can never be forgotten. Please accept our heartfelt condolences on the loss of your cousin. Your father had always been such a trustworthy and dedicated man at work. He had been a valuable asset, and we are saddened by the loss of such a man. During this difficult time, our support and compassion is with you. In this tough time, my condolences are with you. Let me know if I can be of any help. Here’s sending you a favorite dish of yours, so you don’t need to bother over cooking. To help you through this difficult phase of life, our prayers and thoughts are with you. When you are closely related to the person who has recently lost someone, you cannot just send a card with one or two lines of formality written down on it. As that would have adverse effects since the person is already in a low emotional state and if he/she interprets it wrongly, they would think it as a mere duty. “I’m really heartbroken to hear the news of your little brother’s death. He had been such a wonderful boy, a larger than life character. Being your constant companion, you must be terribly missing him. We all miss him as well. He always used to talk about how lucky he is to have an elder sister like you. His performance on the field as well as in class was commendable. He had always been a positive influence for everyone. As mentioned earlier, choosing your words for a condolence letter or message can be really tricky. People often fail to realize the emotional turmoil the deceased person’s near and dear ones are going through and end up with words of extreme rationality or practicality. One should keep in mind that in the hours of sorrow, such words sound nothing but vapid and insensitive. So, be careful with what you are writing. To the person you are writing these words also knows very well that, What time does to one’s wounds. But at the face of the misery and mourning of the lost one, such words of rationality have minimal effect. Repeat the question in your mind. The answer is pretty simple, right? It is NOT going to be okay, never going to be the same. Someone is gone forever, and nothing can bring him/her back. You cannot just carelessly say that to someone who is still trying to accept the deceased one’s absence permanently. Spare the grieving soul from this cliché statement. To be honest, you don’t. You are not in his/her shoes right then, therefore you cannot feel it the exact way even if you try to. So, don’t say it when you don’t feel it. Instead try saying “When I had lost ____, I couldn’t imagine how to ever be normal again. Every loss is harder to face in its own way. Give yourself enough time.” And try suggesting them other things to indulge in. Well of course they might be . Far away from pain, pleasure or any other feeling. But that does not mean that they would feel less pain about it. In this tough time, my prayers are with you. May the God be with you through these hard times. I feel extremely sorry to hear the demise of your dear _____. Don’t stay cooped up at home, take time but communicate to lighten your sorrow. Please withtake my deepest condolence on the loss of your_____. Hope you recover from your misery well. May you emerge out of this woe soon. Even when someone had been through a terrible accident, they need some simple condolence to bring them back to normalcy. The after effect of an accident can be bad, the trauma and constant haunting of the mishap. The situation gets worse when you are offering your comforting words to a sole survivor of an accident. Try understanding their level of hardship. It was no doubt an ill luck, but do not blame yourself for what happened. Although they aren’t alive, they would surely want you to live. Whoever’s fault it might be, it does not matter. Don’t take things too hard. Maybe, he/she had been disturbed in mind with something. I know it is unacceptable for you. Do not question yourself too much. I’m deeply hurt to know about your loss. How did the accident happen in the first place? He/she had always been a ruthless driver. Why did you let him/her drive? How did the car hit you? His/her carelessness proved disastrous for all of you. Did he/she have a fight before leaving home on that day? They need to learn to withstand it and overcome it eventually. Write to them frequently, tell them about how life is going at your end and slowly raise in talks about everyday life and not the mishap. If they don’t want to talk about it, let it be. Everyone has their own separate ways to deal with things. Respect that. Other than the mentioned things to offer your earnest sympathy, you can also gift them with books, flowers, writing pads with notes attached to them to offer help from your side.